! WELCOME to SOAPMANUFACTURING ! This Soap Community will be developed step by step: we can add always more sections and utilities, but YOU are the real developer of this Community, with your posts, ads, questions, replies and comments. 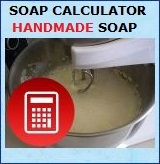 Since we never found a Soap Calculator able to calculate the Glycerin %, the TFM (Total Fatty Matter % in the soap) the Moisture and other important parameters we also developed two new Soap Calculators. 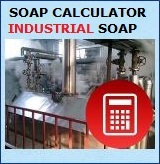 These utilities was created for Industrial Soap Manufacturers, and for Hand Made Soap Makers, specially to calculate the Glycerin inside the soap bars; it is sufficient to read "how it works". A lot of hand-made soap manufacturers are interested to know the Quantity of Glycerin is inside their soap bars; now it is possible !